Bahr Farm on North Bend Road here in College Hill, is the home of Our Harvest, a local farm and food hub working to make sustainably-grown food available to all of the Greater Cincinnati community. 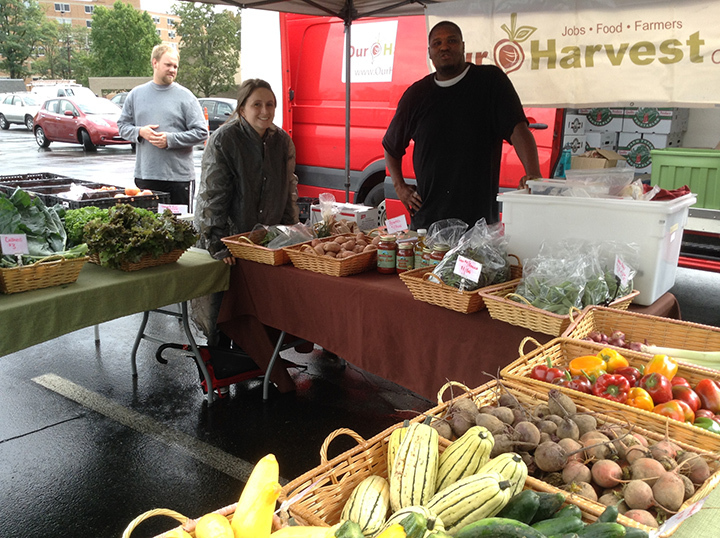 In addition to selling at our farm market, they offer a Weekly Harvest Box Program. It’s a convenient way to bring healthy, local food to your table year round. They offer three box sizes—perfect for everyone from individuals to large families. All produce is grown without the use of synthetic chemicals on local farms. Find out more. Some of our vendors will be moving their wares inside the College Hill Coffee Co. on Thursday afternoons starting October 15. It’s another fine way to stay supplied with fresh local veggies, bread and more through the winter. More about it next week. Hope to see you this Thursday, October 8, for our last outdoor market for the season, from 3:00 to 6:30 pm at the corner of Hamilton and Llanfair. We accept credit cards and EBT. This entry was posted in News and tagged Back Acres Farm, College Hill, College Hill Farm Market, CSA, farmers' market, Harvest Box, local farm, local food, Our Harvest, Shadeau Bread by College Hill Farm Market. Bookmark the permalink.